Are you an independent gym with reception staff? Manage those bookings through our web based solution GymSync. BookFit is a simple to use sports class booking app developed specifically for personal trainers and fitness instructors. 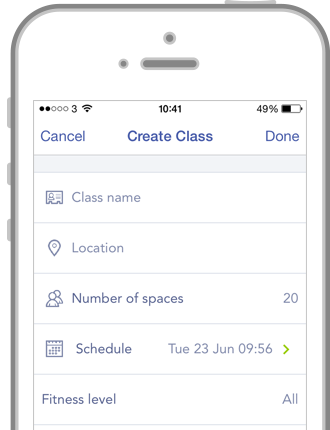 Exactly the people that we know need an easy way to manage their classes on the go, keeping on top of class management directly from their mobile phones. BookFit has been developed specifically for fitness instructors and independent gyms to help them manage their classes on the go. We have conducted extensive research with a wide range of instructors and trainers to fully understand the pains currently faced managing fitness classes. This valuable insight has shaped the development of BookFit and ensured that the features offered in this app will make a real difference to your working life. "I’m often out and about and with my current system I can’t access information on the phone which makes life really difficult." "Our business is everywhere so we need a mobile solution that is fast and easy to use." Keep on top of all management of your classes directly from your phone. It’s easy to check at any time how many people you have registered and to send out last minute messages to customers updating them on changes such as it’s a sunny day so bootcamp is outside or it’s a boxing session so remember to bring your gloves! 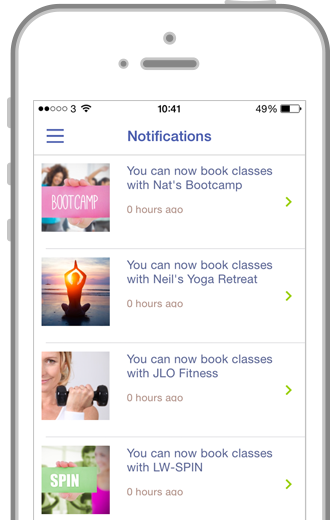 Grow your fitness business and let new customers find you through the BookFit app class directory. Potential new customers will use the app to search for a new class to join by location. Don’t miss out, get involved today and make sure your classes can be found. With BookFit you can quickly and easily create a timetable of all of your upcoming sessions. Using the app you create each session specifying the location and spaces available then publish for everyone to book onto. Simple. 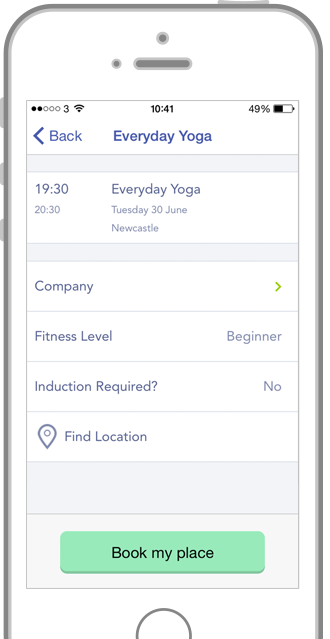 Customers can easily book onto the sessions they wish using the app, making life as simple as possible for them – no having to wait to hear back from you on what spaces are available, and gives them complete control over their fitness, encouraging them to attend as many sessions as possible. As customers book (or cancel) their space at a session, BookFit will automatically update the number of spaces available in real time. ​Give your customers the best opportunity to attend every class they wish to (and keep up their fitness goals!) by reducing the likelihood of no-shows. If a customer tries to book a class which is full they will be asked if they wish to be added to a reserve list. When a space becomes available they will be automatically notified. Keeping customers happy and keeping your classes as full as possible. We also have more exciting developments in the pipeline, including features like integration with your phone’s native calendar, a messenger system, Facebook integration and class payments. Watch this space!